Fulda's enrollment is only 140. But, don't let their size fool you. 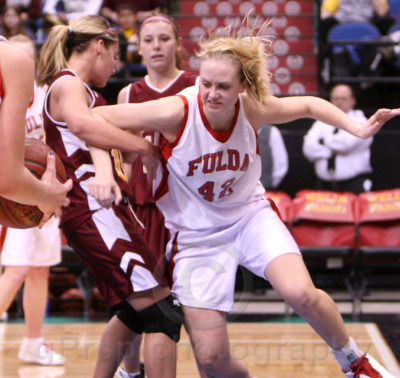 Fulda is building a reputation as an elite basketball program. The repeat 2A state champions cruised to a 42-34 win over Hancock. Fulda's height proved to be too much for the smaller Hancock team. 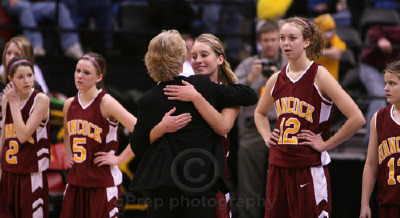 "We did a nice job but you can't overcome height," said Hancock Head Coach Jodi Holleman. Fulda also won the rebounding game 33-29. 6'2 Laura Kramer had a game high 13 rebounds and finished with 9 points. "It feels amazing, especially two years in a row. And now our senior year, it feels good to win on this ending note," Said Kramer. 6am all summer. 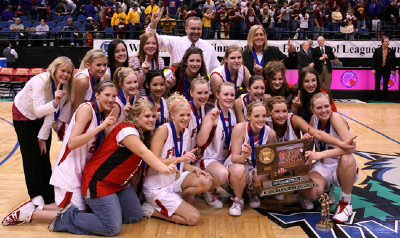 Fulda Head Coach Gregg Slaathaug said, "We are working hard. We play a ton of games in the summer. I demand a lot of them on and off the floor, and they deserve the championship." 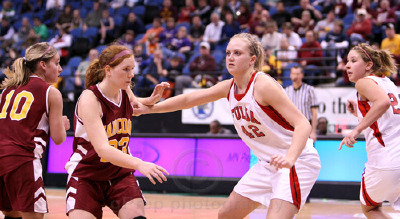 Sarah Raddle added 13 points for Fulda. Hancock's super Freshman Bree Holleman, finished with 3 points.Tara Thielke and Jenny Noordmans finished with 8 points each. including her daughter, Bree Holleman.